Debbi, our new hostess for The Secret Recipe Club is on the ball, and sent out our assignments the weekend after our reveal. This month I am getting to know Sara who blogs over at Cook With Sara. Sara cooks with everyday ingredients which means we are very similar in our approach to our kitchens. I browsed through Sara’s recipe index before deciding to make an adaptation of her Southwestern Potpie as I have black beans that I need to make use of more often. Dave is not really into my black beans as they change the colour of the food but he will just have to get used to that as I sill have quite a lot of them left. I adapted the recipe only because I had leftover buttermilk pastry that I wanted to use up. This was a very moreish recipe and we took the leftovers to work for lunch the next day. This looks so comforting. Love pie! I just love the way you make your chicken pot pie. It looks absolutely wonderful and definitely delish! hi Kristy and thanks for the visit 🙂 I hope you try this pastry as it is so easy! and perfect for a cold winters night! 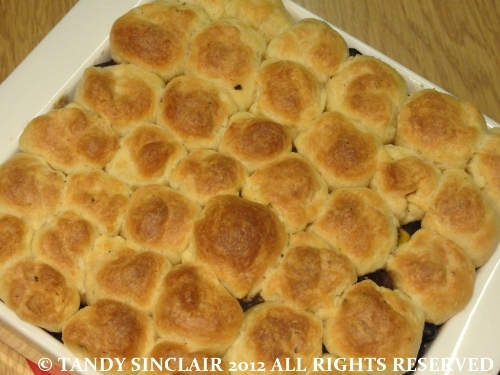 Comfort food at its best, the biscuits on top are fabulous. I love the southwestern twist you put on this! Yum! This pot pie is getting me in the mood for fall! Oooh, yummy! That’s tomorrow’s dinner sorted! You really can’t go wrong with Chicken Pot Pie. Perfect for the cooler weather that we’ve just begun to see. Bring on Fall! Oh wow, that looks gorgeous. I could tuck in right now! We just love Chicken Pot Pie and your recipe looks delicious. Thanks for sharing and have a great day! Oh how I love a chicken pot pie! Can’t wait for the fall weather so I can make this. Looks divine! This looks REALLY good 🙂 So comforting! I love me some chicken pot pie! This looks absolutely delish…perfect for those cold winter nights! I LOVE black beans and use them in a lot of recipes! My motto, when in doubt, add beans! This sounds great and I hope hubby liked it! Great twist to the traditional chicken pot pie. When it cools down a bit, I will be making this! Perfect SRC selection. I haven’t made a pot pie for the longest time – nice to see you used your leftover buttermilk pastry. chicken Pot Pie is one of my favorite meals! looks yummy!